Herald: Basic needs ignored for CCTVs, Smart Cards? 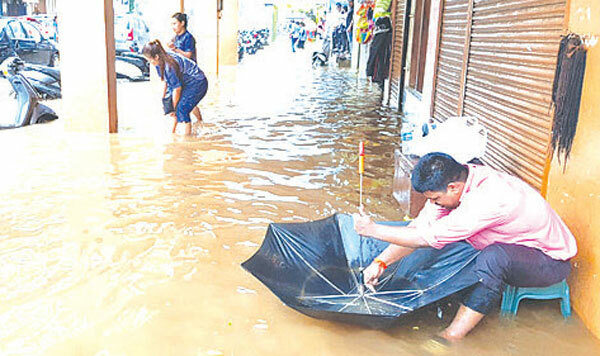 The city of Panjim was ravaged by the first rains earlier this month with flooding, power cuts, trees uprooted etc bringing to fore the various facilities the city lacks. But the city fathers (politicians) seem to living in a different world altogether and seem hell bent on giving the capital town a cosmetic changeover rather than looking into the basic needs. Under the Central government’s SMART CITY scheme the state would get around Rs 500 cr for various development works. But instead of looking into the basic needs the Imagine Panaji Smart City Development Ltd (IPSCDL), a Special Purpose Vehicle for implementing the project seemed to be far away from the reality of basic needs. Strange, Panjikars feel the politicians seem to be living in a fools world. Despite being the capital city, the condition is critical and if not paid heed it could get even worse. The priorities of the IPSCDL are the security with CCTV cameras (Rs 180 cr), a city Smart Card, cycling tracks and free cycling service, parking plans etc. Electricity: As throughout the State, power is a major issue every household is facing due to load shedding or shutdowns. Be it Panjim, Ribandar, Taleigao, Donapaula or any other the situation is same everywhere. Water: Despite giving assurances and laying of new pipelines, water is still not available 24x7 to the residents. Sanitation: Take a visit to Camrabhat or Chimbel, a place within few kms from the capital and one would see Prime Minister Narendra Modi’s Swacch Bharat Abhiyan seem to have gone for a toss. The Prime Minister has been working on making India Open Defecation free but Chimbel and Camrabhat - seem to be excluded from the scheme. The 3000-odd residents have just six public toilets in Camrabhat. Shocking right? Just at the start of the locality you will find piles of garbage haven’t been lifted for months. Is this Swach Bharat we are looking for? Garbage: While the Panjim city now has a small new treatment plant near KTC stand it is inadequate to handle the city’s waste. As a result the waste is being sent to Saligao solid Waste Management plant. The priority should have been to set up Waste plant at Baiguinim or any other suitable place. Drainage: Well, the first rain itself exposed the fact the drains were choked and the pre-monsoon works had not been carried out. The main roads of 18 June Road, Dayanand Bandodkar Marg, places in Mala, the Kadamba Bus stand get flooded with a few hours of rain. Transportation: While we are looking into the CCTVs and smart cards, one major issue with Panjim is a proper public transportation. There isn’t proper transportation to various localities forcing the residents to use their vehicle which is causing traffic jams, parking issues. Proper public transportation could sort this issue. Roads: Despite being capital city, the city roads are in bad shape, especially in St Inez, Bhatulem and Taleigao which needs attention.